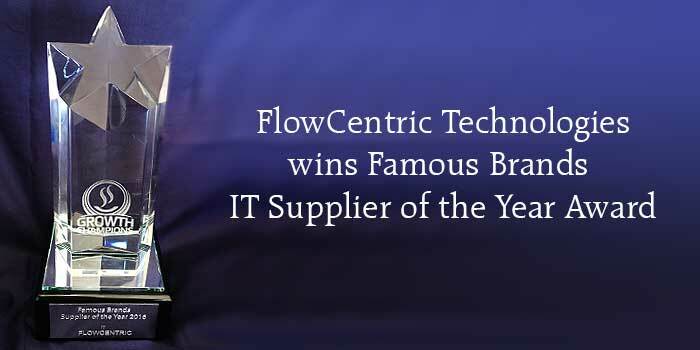 The Venue Green Park, Johannesburg - At an award ceremony held by Famous Brands Limited on Wednesday 11 May 2016, FlowCentric Technologies was named as the Famous Brands IT Supplier of the Year 2016. Famous Brands Limited is Africa’s largest branded food service franchisor, with a franchise network of 2 545 restaurants across South Africa, Africa, the United Kingdom and the Middle East. The brand portfolio comprises an extensive array of mainstream and emerging brands ranging from Mugg & Bean, Fego Café, Steers, Wimpy, Debonairs Pizza to Vovo Telo and pub brands such as KEG and O’Hagan’s. The Group also manufactures and supplies its franchisees and the retail trade with a wide range of meat, sauces, spices, cheese, bakery, coffee and other hot beverage products. FlowCentric Technologies has been working with Famous Brands over the past year to create an integrated ecommerce storefront, leveraging off the power of Processware’s API. It is a great honour to be recognised as the Famous Brands IT Supplier of the Year 2016. We hope to consistently grow our relationship with Famous Brands and continue to support the organisation in achieving its goals. Congratulations to the FlowCentric Technologies team and thank you to Famous Brands for recognising our efforts. FlowCentric Technologies is a global provider of Business Process Management (BPM) and Optimisation software, solutions and services, which are designed to support organisations during every step of their business transformation initiatives. The company’s proprietary software, Processware is used to streamline and automate business operations in many major industries across the globe. A diverse range of companies, from large corporates to mid-markets, including financial services, government, insurance, manufacturing and brewing industries rely on Processware to keep their business running smoothly.